I have this memory of Hiroe during Isness' production: Myself, saying "good night" and leaving her in the studio to work into the wee hours. It wasn't that I asked her to do it. It was her work ethic and drive that kept her in the studio late. I also remember her showing up for the shoots in which we used the animals she created, even though I could not pay her for it, in order to manage their function and and make sure all went well. I found Hiroe through word of mouth during the fervent days before launching Isness' production. Hiroe had already amassed a plethora of skills from her studies in schools in Japan, Canada and the UK. She hadn't been in the United States for very long and was happy to join my low budget production for the sake of practice and to fatten her resume. I soon realized that I had gotten very lucky and caught this superb, multi- talented individual before she got whisked away to play with the "big boys". 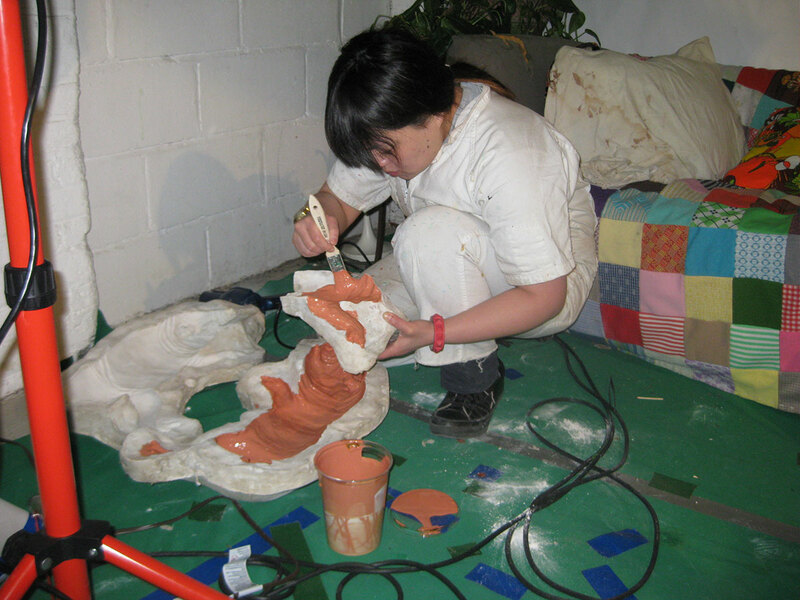 Together with Cristina Atkin they set up a little prop workshop in my studio and before I knew it, there were sculptures taking shape, rubber molds being created and fur and feathers flying around. One of the things that struck me during the time Hiroe worked on Isness,was her ability to switch from cute to gory prop making, from glamour makeup to wounded flesh effects, all at the drop of a hat. 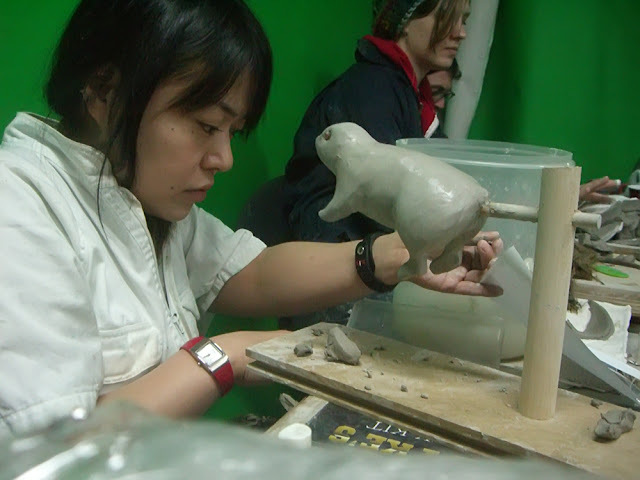 During the butchering scene, Hiroe keeping her animals in functioning order during the butchering scene. Sculpting the body for the gopher which Hunter catches in Volume One. (Cristina Atkin to her right). Soon after Isness production, Hiroe moved to LA and began to apply her talent in bigger productions. 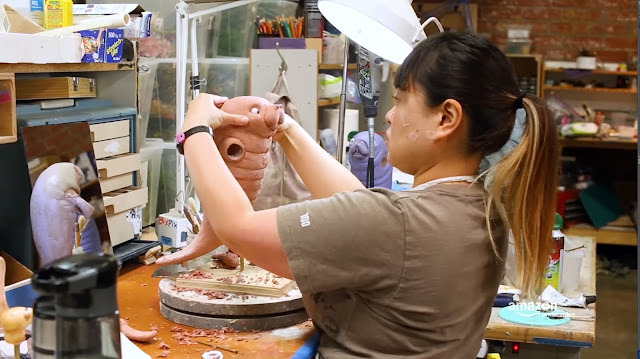 She worked at BIX PIX ENTERTAMENT and ATLANTIC WEST EFFECTS before landing her most recent position as sole puppet and set sculptor on Tumble Leaf, a show for preschool kids, which won many awards, including five Daytime Emmy Awards. S: Did you adopt any new hobbies or activities since you moved to LA? H: Well, I don’t have any new hobbies but I’m back to traveling more! 2 years ago, 2016, I traveled to 7 countries, and in 2017, went back to Japan twice and to Switzerland in the summer. Now I'm planing to go somewhere else the end of the year. I guess that’s I like to do now. S: What do you think about working in the LA scene Vs. the New York scene? KIRIN, Chinese mythic creature “Qilin Dragon" (known as the label of a Japanese beer), is shaped like a deer with a dragon face, cow tail, horse legs, and scalse on the body. This is about a 1’ size sculpture with oil based clay. This was my first maquette from 2013. 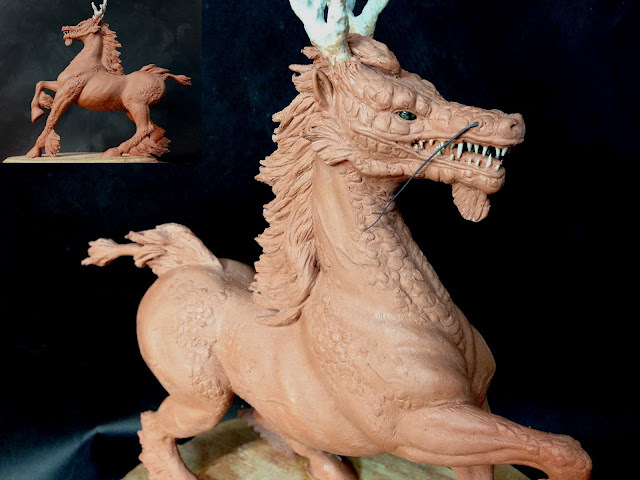 I had a bit of a hard time sculpting the horse anatomy but I enjoyed it. I will cast and paint it in the future. Baby Hippos! 4”x 5”. Sculpted with clay, molded and cast in resin. Painted with acrylics. (And I hear that these two cuties happen to be for sale! ).